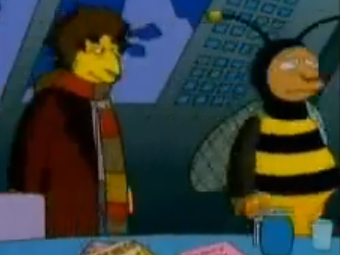 Finding this sent me off looking through YouTube for other Doctor Who references/cameos I may have missed including this Simpsons bit that made me think, "the Bumbleebee Man from Channel Ocho might have been an improvement on Adric," but then I felt bad for thinking ill of the (fictionally) dead. Then I felt stupid for that and thought it again. But then I felt bad for thinking ill of the performance of the (very much alive) Matthew Waterhouse who had the misfortune of being stuck in a TARDIS with too many companions. Then I remembered I have a ton of work I need to get done and need to stop avoiding it by blogging any old bit of Doctor Who-related anything I could find.